ATW: What does 🤟 - Love-you-gesture Emoji mean? A universal emoji! Or ... is it? The love-you gesture or I love you hand sign emoji is the American Sign Language gesture for "I love you," showing a hand with a raised index finger and pinky (little) finger and an extended thumb. It comes in a range of skin tones. It's used to express affection ... but is also used when people are trying to find the sign of the horns 🤘instead (oops). It seems a natural fit for the Unicode consortium (emoji gatekeepers, for the most part) to embrace American Sign Language signals. The love-you gesture or I love you hand sign emoji was approved for Unicode 10.0 in 2017 and added to Emoji 5.0 in 2017. Perhaps, surprisingly to some, the love-you gesture emoji is commonly used in reference to rock music, due to its similarity to its rock’n’roll cousin, the sign of the horns or rock on emoji. 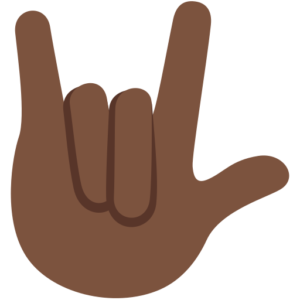 The love-you emoji shows the thumb extended, as it is in American Sign Language, while the sign of the horns emoji depicts the thumb tucked into the hand. Browsing social media, you may be struck by the range of uses for the the love-you gesture emoji. It’s used to express affection or intense approval for someone or something, romantic love, and even, yes, a kind of “rock on!” enthusiasm where they could use the more rock’n’roll emoji, the sign of the horns. Maybe they choose the love-you gesture for the extra positivity, right? Who says emojis don’t do a great job of conveying emotion?